We’d love your help. Let us know what’s wrong with this preview of Don't Make Me Think, Revisited by Steve Krug. Since Don’t Make Me Think was first published in 2000, over 400,000 Web designers and developers have relied on Steve Krug’s guide to help them understand the principles of intuitive navigation and information design. In this 3rd edition, Steve returns with fresh perspective to reexamine the principles that made Don’t Make Me Think a classic-–with updated examples and a new Since Don’t Make Me Think was first published in 2000, over 400,000 Web designers and developers have relied on Steve Krug’s guide to help them understand the principles of intuitive navigation and information design. 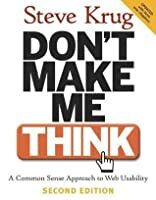 In this 3rd edition, Steve returns with fresh perspective to reexamine the principles that made Don’t Make Me Think a classic-–with updated examples and a new chapter on mobile usability. And it’s still short, profusely illustrated…and best of all–fun to read. To ask other readers questions about Don't Make Me Think, Revisited, please sign up. Is this really web focused or is it a good design book in general? Thomson Muriyadan It's mostly focused on web and by extension mobile applications (digital interfaces). It also covers the importance and basics of usability testing. …moreIt's mostly focused on web and by extension mobile applications (digital interfaces). It also covers the importance and basics of usability testing. Well, this is an absolute gem of a book. I picked this up the day after finishing Beautiful Code and to be honest, really wasn't in the mood for any more particularly heavy content for a few days. But Steve Krug makes the topic of web usability genuinely entertaing. He holds a light writing style with a touch of wit that helps to keep your attention from cover to cover. Add to that the short size of the book at only a couple of hundred pages, and the vibrant but clear layout and you've got a book Well, this is an absolute gem of a book. I picked this up the day after finishing Beautiful Code and to be honest, really wasn't in the mood for any more particularly heavy content for a few days. But Steve Krug makes the topic of web usability genuinely entertaing. He holds a light writing style with a touch of wit that helps to keep your attention from cover to cover. Add to that the short size of the book at only a couple of hundred pages, and the vibrant but clear layout and you've got a book that's in itself extremely usable and accessible. When it comes to the content itself, it couldn't be explained clearer. Steve's chapters are logical and concise, you won't find any waffle in here that doesn't help to communicate the message of the chapter. He uses a adequate number of examples to illustrate his points, and even helps to demonstrate how various stakeholders in web projects can all contribute to the usability of the site. For me, the most interesting idea was of usability testing. Having led a relatively sheltered web life, with most of my work either focusing on small scale projects or internal projects, the concept of usability testing presented as a lightweight process that can be repeated at minimal cost over and over again had not occured to me. Steve presents a framework for running these sessions that elimates all excuses for usability testing to be included in a project lifecycle. فكرته قائمة على العنوان " لا تجعلني أفكر "
فهو يعطي فكرة لكل مبرمج أو مطور للمواقع أن يقدم موقع للزائر بحيث يكون الموقع بسيط و سلس و واضح دون حاجة ذلك الزائر لإن يدخل - بالحيط - حتى يتمكن من فهم قصدك كمبرمج للموقع . I read this handbook on Web usability for work related reasons. It was originally published in the early 2000’s, shortly after Jakob Nielsen’s Designing Web Usability. Both Krug and Nielsen have since become (along with Steve Jobs and Jony Ives, at Apple) the head honchos of Web Design. This short and highly readable book covers topics such as: how people really use websites (they don’t actually read, they like to scan and browse mindlessly… but we already knew that, didn’t we? ), how to design na I read this handbook on Web usability for work related reasons. It was originally published in the early 2000’s, shortly after Jakob Nielsen’s Designing Web Usability. Both Krug and Nielsen have since become (along with Steve Jobs and Jony Ives, at Apple) the head honchos of Web Design. This short and highly readable book covers topics such as: how people really use websites (they don’t actually read, they like to scan and browse mindlessly… but we already knew that, didn’t we? ), how to design navigation and breadcrumbs, etc. Krug insists on the importance of usability testing: one chapter is actually a cookbook on how to conduct user tests without getting top-heavy on the matter. This recent republication also includes a chapter on designing for mobile and accessibility. A very enjoyable, casual (and oftentimes fun) read, that the staff at Goodreads should consider rereading from time to time: a word to the wise is enough! Every programmer needs to read it. It makes me think deeply about usability and accessibility. For example after I read a chapter on accessibility, I decided to design a website which could be helpful for blind people. It's main purpose is to help us have a better life. Because we use software more than anything else now. You are reading my review on a website or on an application. Steve Krug's style makes me have a smile on my face while reading and understand it very well. MUST READ for anyone with any say over the look & feel of a commercial web page (designers, managers, marketing people, executives, etc.). It's a quick and easy read and is like having my own web usability consultant. Goodreads and LOTS of other sites should have their managment teams read this. Quick, thorough, and to the point, as it suggests. Even inspired me to write a review, on the web. I don't even NEED to think twice to say this was a VERY GOOD * e^3 read!! It really is a book that can stand the test of time, though all three iterations, it keeps the tone and message: "good web design starts with instinct of the user." Krug's book focuses on web usability, fundamentals of good design, and user experience testing. Every web designer should get their hands on this as it is a referen Quick, thorough, and to the point, as it suggests. Even inspired me to write a review, on the web. I don't even NEED to think twice to say this was a VERY GOOD * e^3 read!! I was predisposed in favor of this book because it's the most-voted-for on the UX Stack Exchange. It wasn't all I'd hoped it would be. If this were the first text about usability I'd read, I might have gotten more out of it. As it was, the overwhelming majority of the topics presented seemed patently obvious to me. One thing this book has going for it is its brevity. Before agreeing to publish a second edition, Krug insisted upon first discovering what could be removed from the first edition so t I was predisposed in favor of this book because it's the most-voted-for on the UX Stack Exchange. It wasn't all I'd hoped it would be. If this were the first text about usability I'd read, I might have gotten more out of it. As it was, the overwhelming majority of the topics presented seemed patently obvious to me. One thing this book has going for it is its brevity. Before agreeing to publish a second edition, Krug insisted upon first discovering what could be removed from the first edition so that no extra length would be added. Rather than writing about details of debates relevant only to people completely immersed in usability, he aims to convey the most essential concepts of the usability field as briefly as possible. In this he succeeds. The book is a clear introduction to some of the most important principles of the field. However, it glosses over them without going into depth. Perhaps the most useful part of the book is a transcript of a sample usability test, including what to say and do at the beginning of the test. The introduction says that this chapter was abridged from three chapters in an earlier version of the book and some of the content was moved to Krug's site and expanded upon in a later book, which I am now interested in reading. - The function of every element on the page should be as obvious as possible. Aim to make things self-evident, but make them self-explanatory at the very least. - Expect users to skim, satisfice, and muddle through pages. Designers should make it easy to skim and make it so that users have to muddle as little as possible. - Use a clear visual hierarchy to help users find things faster. - Don't go against conventions unless your change brings a significant and easy-to-learn improvement. - Assume that every element is visual noise. - Use navigation elements not just to show people how to find what they're looking for, but also to give them a sense of where they are and what else the site contains. - Navigation should be consistently laid out through all the levels of the site, not just the top two. - Navigation elements (particularly those showing the location of the current page) should stick out. - Tabs connecting to the pages below are strong navigational elements. - All headers and labels should be clearly associated visually with the elements they relate to (framing those elements). - The navigation should be the same on all pages except for the homepage and pages with forms. - You shouldn't expect any one feature to be the best way of doing something for all users (or a mythic Average User); instead focus on whether it creates a good experience for users who encounter it in its current context. - Focus groups are for initial planning; usability tests are for iterative improvement. - Test early, informally, and often. This way, you can improve the product and encounter issues in later tests that weren't evident until issues from the first test were resolved. - You can set up an inexpensive yet effective usability lab by placing a camcorder monitoring the screen in one room leading to a TV displaying the video to stakeholders in another room. Use a screen recorder as well. - Before you have a working prototype, run tests on a couple of sites with similar features or functionality to get a sense of what works well about them. - Be considerate of the user. Try to have their best interests at heart. - To help make a site accessible to people with disabilities, first make sure it's usable for people without disabilities. - Several small tweaks in the code can drastically improve accessibility. این کتاب رو خودم یه نگاهی فقط بهش انداختم اما یکی از دوستان خلاصهای رو ازش در اختیارمون گذاشت. درسته که کتاب نسبتا قدیمی محسوب میشه اما نکات مهمی توش هست و به عنوان لیستی از چیزهایی که باید/نباید رعایت کنیم رو در بهمون میده. برای شروع یو ایکس میتونه مفید باشه. این کتاب رو خودم یه نگاهی فقط بهش انداختم اما یکی از دوستان خلاصه‌ای رو ازش در اختیارمون گذاشت. This book is what it states - a common sense approach to web usability. 1. Users do not read the text in a web page. 2. Users muddle through a web page, no matter how well thought out the layout, and menus are. And as a designer, your task is to take these two facts into account when designing your website. The author, Steve Krug, is very perceptive. While this is evident throughout the book, what did it for me was the footnote about the Site ID being on the top This book is what it states - a common sense approach to web usability. The author, Steve Krug, is very perceptive. While this is evident throughout the book, what did it for me was the footnote about the Site ID being on the top right corner in web pages with right to left languages, and his comment about inconsistent navigation options in many sites once you are two or three pages deep. The first one is a nice call-out, the second - I've been burnt by it so many times! The section that talks about how to resolve "design" (people) problems, when members of different teams prefer one design over another, is a life-saver for any Project / Development / Product Manager. It clearly brings the focus back to the problem - are we doing the right thing for the intended users of this website? The graphic showing what a webpage means to a CEO, Developer, Designer, and Marketing, nails each group's perspective on the head. The difference between a focus group, and a usability testing team is explained well. The chapters on usability testing is a must read for all QA teams. The table showing how much it would cost to do "Get it" and task-based usability testing is very concise, and useful. I would recommend taking this no-frills approach; a part of my org's development methodology. 1. The proliferation of social media, and how to design for that. 2. Web-based Enterprise application UI design. #2 above is closer to home for me. Type of question that I would like to be tackled - In web based Enterprise apps that specifically deal with a particular vertical (say Insurance), how much can you assume that the user knows about the domain, and consequently, how does that affect your design? The book is well laid out, and you can see evidence of the author eating his own dog food. The footnotes offer interesting segues (sometimes not about web usability), and the Recommended Reading section is a big plus. An excellent introduction to creating usable websites. As the title states, every website’s design and functionality should be so simple that people barely need to think to use it. The book’s 2nd edition is from 2005, so some examples are dated, but the concepts are quite relevant. This was a fun read due to its straightforward style and Krug’s humor. When I started looking for web design books, Steve Krug’s classic on web usability frequently appeared at the top of most lists, along with Designi An excellent introduction to creating usable websites. As the title states, every website’s design and functionality should be so simple that people barely need to think to use it. The book’s 2nd edition is from 2005, so some examples are dated, but the concepts are quite relevant. This was a fun read due to its straightforward style and Krug’s humor. When I started looking for web design books, Steve Krug’s classic on web usability frequently appeared at the top of most lists, along with Designing with Web Standards by Jeffrey Zeldman (see my review). I highly recommend both books. First Law: Don’t make me think. Make things obvious and self-evident, or at least self-explanatory. People scan; they don’t read. People choose the first reasonable option. People muddle through things rather than figure them out. Second Law: It doesn't matter how many times I have to click, as long as each click is a mindless, unambiguous choice. Make choices mindless for ease of use. Third Law: Get rid of half the words on each page, then get rid of half of what's left. Be ruthlessly concise. Test early and often. Test with 3 or 4 users. Have each user think out loud as they use the site. Use a screen recorder to record the session for reference. Fix any problems, then test again. Review the results as soon as possible. Navigation helps users find things, tells them where they are, reveals content, and tells how to use the site. It must be good enough to help people who land on any page. The home page should have a personable, lively tagline conveying a value proposition. The home page also needs a short, scannable welcome blurb describing the site. Know what people want, and make those things obvious and easy. Only ask for information necessary to complete the transaction. - The good humour, examples and metaphors the writer uses to explain things. They really work. The book was a short, quick and easy read that can easily be finished on a plane ride. It's in full color with a couple of helpful diagrams, but I mostly found the comics in it annoying and patronizing. A lot of what Krug brings up in the first half seems like common sense, but he does delve deeper into some points, which may be helpful for some. 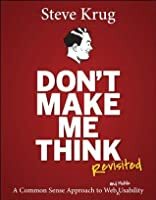 The most valuable information I found in Don't Make Me Think was the little quizzes in the middle of the book where readers are presented with sample we The book was a short, quick and easy read that can easily be finished on a plane ride. It's in full color with a couple of helpful diagrams, but I mostly found the comics in it annoying and patronizing. A lot of what Krug brings up in the first half seems like common sense, but he does delve deeper into some points, which may be helpful for some. 4.5 stars. I’ve been busy traveling for work and not getting the chance to read as much for fun, but managed to read the update to this timeless reference book for basic website (and now mobile) usability. It’s very basic (and even calls itself out as such), but I think it’s a great introduction to the areas of web and mobile usability and is something anyone who is a fan of well-designed products would enjoy! Books about design need to pass one critical test. They must be well-designed, and this book is. Among the bits of knowledge Krug sprinkles, good web design is like the layout in a big box store, you should be able to look up and find signs that point you in the right direction. There is one crucial different between a brick and mortar store and its online counterpart: if you can’t navigate your way to what you want in a store, you can always ask someone. On the web that’s not possible, so web s Books about design need to pass one critical test. They must be well-designed, and this book is. Among the bits of knowledge Krug sprinkles, good web design is like the layout in a big box store, you should be able to look up and find signs that point you in the right direction. There is one crucial different between a brick and mortar store and its online counterpart: if you can’t navigate your way to what you want in a store, you can always ask someone. On the web that’s not possible, so web sites live and die by how easy they are to use. Here’s an insight: most people think users hate making lots of clicks to find their way to way to what they want. Not true. Users want to know that the search will be fruitful. They also want to find the right links intiatively and they want to be able to retrace their steps quickly if they turn down a wrong alley. I strongly recommend this book for anyone, novices and experts, who are serious about web design. My only regret is that I didn’t read this book before I started to develop my company’s portal. In this book, Krug shows you how to make things easy for visitors to your site by making sure everything on it is obvious at a glance and easy to find and get to. And he practices what he preaches - I picked this book in large part because of its clear, attractive, reader-friendly design. It's a quick read, but you may want to take your time on it a bit to make sure you fully register everything he says. There are applications of what he says far beyond web design. I teach pronunciation, and know In this book, Krug shows you how to make things easy for visitors to your site by making sure everything on it is obvious at a glance and easy to find and get to. And he practices what he preaches - I picked this book in large part because of its clear, attractive, reader-friendly design. It's a quick read, but you may want to take your time on it a bit to make sure you fully register everything he says. There are applications of what he says far beyond web design. I teach pronunciation, and know that people really don't want to have to grapple with poor pronunciation and incorrect grammar to get at what a speaker actually meant to say. Those who say the listener should do some of the work too are not thinking about how competition for attention and resources works in the real world. يشرح ستيڤ بشكل بسيط ومرح مفهوم قابلية الاستخدام، الشيء الذي - حسب وصفه - يعتبر بديهي" لذوي التفكير السليم ". يتمحور الكتاب حول فكرة واحدة، وهي أن “ لا تجعل المستخدم يفكر “، وأهمية كون صفحات الويب تشرح نفسها بنفسها وكيف لهذه الفكرة أن تولّد ثقة المستخدم في الموقع. يناقش الكتاب أيضا طرق تصفح المستخدمين للمواقع، وحقيقة أنهم لا يقرؤون محتوايتها كلمة كلمة، لكنهم يمرون سريعا - جدا - باحثين عن كلمات مفتاحية ؛ مع ملاحظة أن هذا لا ينطبق على المدونات الشخصية والمواقع الأخبارية - غالبا -. مع ذلك، فالكتاب - و يشرح ستيڤ بشكل بسيط ومرح مفهوم قابلية الاستخدام، الشيء الذي - حسب وصفه - يعتبر بديهي" لذوي التفكير السليم ". مع ذلك، فالكتاب - وللأسف - يفتقر إلى كثرة الأمثلة العملية، ولم يتعمق في بعض المسائل، هذا ما يجعله غير مناسب لمن تجاوزت خبرته الـ 3 سنوات في مجال تصميم واجهات المستخدم. Don't Make Me Think is a book about web usability. Usability is basically how easy it is too efficiently use a website. It tests how to make a website easier for the average visitor. This book gives you insights into how to make a website easy to use. The first principle is to make your website as obvious as possible. For example, if the visitor is looking for employment information, it should use the most obvious words to describe employment like jobs or resume. The other point it makes is that people don't read websites they do magazines or books, they scan through a website quickly. Most people do not want to scroll through screens of information. They want to go to the first place which gives them relevant information. They are seeking "satisficing", that is the place where they will get the information they need, not the best information. Steve Krug describes how a website is more like a billboard than a magazine. The title should be prominently displayed on all the pages, and there should be a link back to the home page on every page. The most important piece of information on the web page should be the most visible. Links should be obviously shown as links. This is why I usually put the full url in my blog posts for sites that you can visit. Steve Krug quotes from The Elements of Style, "Omit needless words." He further says you must eliminate happy talk, marketing talk, and jargon from your site. People do not have very much patience on the internet. There are some interesting concepts described about how people find things. He has many diagrams on how people seek out to buy things on the web. These diagrams explain how to make the experience quicker and easier. He also describes how to create a visual trail for the user on a web site. This often called "breadcrumbs." At times this gets a bit complex. There is also a description of the basic elements of a homepage for a business. This book is mostly focused on business and professional websites, not the home user. It often describes how a development team in a business would build or test a website. This is my first experience with this kind of material. Some of the elements in a professional homepage are search functionality, timely content, and shortcuts. He mentions that the title of websites should have a catchy tagline attached to them. This should explain exactly what the website is about. The final chapters are how to do usability testing in a very inexpensive manner. He describes the basic setup with a camcorder, cabling, computers, and screen capture software. Then he tells how you can test a website with small groups of people to see whether or not it is easy for them to use. I understood the majority of this. However, it is not something I am planning on doing immediately. Immediately after the cheap usability testing, he gives an outline of the context of what generates goodwill and bad will in a website. For example, some of the elements which generate goodwill are making it easy to recover from errors, putting in printer friendly pages, and knowing what the main thing people want in your website then implementing it. The last few pages have several books which he recommends you read to improve your web site usability. Some of them look quite interesting. I may order several of them for my library. There is an index in the back of the book as well. The book is illustrated in full color. There are pictures on almost every page. The artwork is pleasant to look and relevant to the content of the book. The book itself is designed so it is easy to read. The author claims you should be able to read through the book in about two hours. It took me three hours with several interruptions. A nice overview of basic usability principles for building user interfaces. The call for do-it-yourself user testing is extremely important, though ignored or unknown to many companies. The sense of humor is great and the advice is fairly actionable and easy to follow. The only downside (and hence a 4 star rating) is that the book could use more real world examples. Seeing many more screenshots of websites that do something well, side by side with those that do it poorly--or better yet, examples A nice overview of basic usability principles for building user interfaces. The call for do-it-yourself user testing is extremely important, though ignored or unknown to many companies. The sense of humor is great and the advice is fairly actionable and easy to follow. The only downside (and hence a 4 star rating) is that the book could use more real world examples. Seeing many more screenshots of websites that do something well, side by side with those that do it poorly--or better yet, examples of incrementally improving a single design based on user testing--would make the lessons much more sticky. The actual Average User is kept in a hermetically sealed vault at the International Bureau of Standards in Geneva. If your audience is going to act like you’re designing billboards, then design great billboards. The main thing you need to know about instructions is that no one is going to read them. I think every Web development team should spend one morning a month doing usability testing. In a morning, you can test three users, then debrief over lunch. That’s it. When you leave the debriefing, the team will have decided what you’re going to fix before the next round of testing, and you’ll be done with testing for the month. Experts are rarely insulted by something that is clear enough for beginners. I had a pact with some fellow web nerds at work to read a book on usability to improve our websites. I chose this one because, like a good website, it had short pages and a lot of white space. I was pleasantly surprised to actually enjoy the content as well as the writing style. It is concise, informative, practical, and humorous. Whereas Jakob Nielsen’s classic usability books are chock-full of statistics and details, this book is a new approach to usability, stripped down to what is practical I had a pact with some fellow web nerds at work to read a book on usability to improve our websites. I chose this one because, like a good website, it had short pages and a lot of white space. I was pleasantly surprised to actually enjoy the content as well as the writing style. It is concise, informative, practical, and humorous. Whereas Jakob Nielsen’s classic usability books are chock-full of statistics and details, this book is a new approach to usability, stripped down to what is practical and quickly measurable. Steve Krug's time- and money-saving method of web testing alone is worth the read for developers. Even casual web designers can benefit from the simple concepts and step-by-step “effective websites use this” lessons and examples. Reading this book generated more ideas and interest in a needed web redesign than I thought possible. Its approach is not a heavy-handed laying down of rules, but descriptions of typical scenarios and problems and possible solutions in a way that stimulates creative thought in the reader. It’s formatted to be easily browsable and readable, making it a quick reference for web developers with time budgets—as if there were any other kind! This book will benefit anyone who is putting together a website, offering tips on making it more logical and informative, thus more popular among users. This book lays out some clear and obviously effective principles of usability that I would definitely look over before tackling interface design. Krug reminds us that ‘ease of use’ is easily the make or break deal for any website. “It’s a fact: People won’t use your web site if they can’t find their way around it.” Here we get proof again, that user experience is the key to any successful type of website. While some of the stuff may be obvious, or maybe just be obvious to me, I found his style to This book lays out some clear and obviously effective principles of usability that I would definitely look over before tackling interface design. Krug reminds us that ‘ease of use’ is easily the make or break deal for any website. “It’s a fact: People won’t use your web site if they can’t find their way around it.” Here we get proof again, that user experience is the key to any successful type of website. While some of the stuff may be obvious, or maybe just be obvious to me, I found his style to be amusing and a reflection of what really goes on in the head of the designer when it comes to designing and the politics surrounding it. His axioms are helpful for any beginners trying to rehaul a horribly designed website, but they don’t help with any complex problems of interaction. Perhaps Steve Krug willl explain those in another book. Usability hardly concerns strictly web use. This tidy introduction and exploration on the subject is a great background to many of the buzz words heard in the creative and development team departments. Also, makes many design decisions easy by providing research based and diplomatic responses to many territorial squabbles that arise when sites are designed/redesigned. It provides logical guided procedures for any stakeholder to understand the overall objectives of the website and make business d Usability hardly concerns strictly web use. This tidy introduction and exploration on the subject is a great background to many of the buzz words heard in the creative and development team departments. Also, makes many design decisions easy by providing research based and diplomatic responses to many territorial squabbles that arise when sites are designed/redesigned. It provides logical guided procedures for any stakeholder to understand the overall objectives of the website and make business decisions with full disclosure of usability consequences. This book is an endless champion for improving and maintaining users' "goodwill reservoir"
I bought this book because I needed a quick overview on usability testing. It succeeded on that front. I even had no issues skipping to the usability testing chapters, reading those first, and coming back to the rest of the book: each chapter is pretty self-contained. Steve Krug's book is a classic for a reason. Great overview of a lot of topics, including pointers for where to dig more deeply into usability testing, accessibility considerations, etc. Very high-level, simple, clearly-written advi I bought this book because I needed a quick overview on usability testing. It succeeded on that front. I even had no issues skipping to the usability testing chapters, reading those first, and coming back to the rest of the book: each chapter is pretty self-contained. Steve Krug's book is a classic for a reason. Great overview of a lot of topics, including pointers for where to dig more deeply into usability testing, accessibility considerations, etc. Very high-level, simple, clearly-written advice and easy on the eyes in terms of reading and knowing what topic you're reading about. He follows his own advice, especially about cutting out unnecessary words---this book is dense with information not because it's written at a really high level but because he doesn't waste your time making you read sentences you don't need. This was a great book for a starting point to website UI design. I have been designing websites and web bases applications for years and haven't ever stopped to think about usability, the 1st impression, and how to accomplish these effectively. Before reading this book I though I knew all there was to design, however this book has provided me with some additional needed insight. This was a quick read, I expected this book to be very lengthy and provide design principles and examples. But what thi This was a great book for a starting point to website UI design. I have been designing websites and web bases applications for years and haven't ever stopped to think about usability, the 1st impression, and how to accomplish these effectively. Before reading this book I though I knew all there was to design, however this book has provided me with some additional needed insight. This was a quick read, I expected this book to be very lengthy and provide design principles and examples. But what this book actually provided was really what I needed. It was quick and to the point at only 197 pages, with great examples of what to do and what not to do and WHY (the important part). The only hang up on this book that I had was the content seemed a little outdated as things quickly do for web related topics. I absolutely love it when non-fiction books don't try to be so heavy in their content, and are able to communicate fascinating material with humour, tact and intelligence, and this book fits the bill to a tee. I loved the style of writing, and for a book that was required reading for university, came away actually learning something and not feeling like it was a chore to pick it up, I even looked forward to it. I loved the length too - too many authors seem to love the sound (sight?) of their own I absolutely love it when non-fiction books don't try to be so heavy in their content, and are able to communicate fascinating material with humour, tact and intelligence, and this book fits the bill to a tee. 1. Use conventions unless you are genius. 3. Break pages into clearly defined areas. 4. Make it obvious what’s clickable and what’s not. 6. Format content to support scanning. I'd bet most people could pick up a thing or two from it no matter how much web experience you have. Also, its a fairly short book, which was good. Still I think i was thinking it would have been more focused on best practices in web design, and it was a bit broader than that. More of a jumping off point than anything else. Very informative on user experience of any medium. Like the title of the name, users shouldn't have to feel stuck or to overthink on decisions. This book teaches on how features should display and its functionality should be a simple process to the end user. 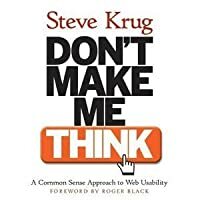 Steve Krug (pronounced “kroog”) is best known as the author of Don’t Make Me Think: A Common Sense Approach to Web Usability, now in its second edition with over 300,000 copies in print. Ten years later, he finally gathered enough energy to write another one: the usability testing handbook Rocket Surgery Made Easy: The Do-It-Yourself Guide to Finding and Fixing Usability Problems. The books were bas Steve Krug (pronounced “kroog”) is best known as the author of Don’t Make Me Think: A Common Sense Approach to Web Usability, now in its second edition with over 300,000 copies in print. The books were based on the 20+ years he’s spent as a usability consultant for a wide variety of clients like Apple, Bloomberg.com, Lexus.com, NPR, the International Monetary Fund, and many others. His consulting firm, Advanced Common Sense (“just me and a few well-placed mirrors”) is based in Chestnut Hill, MA.